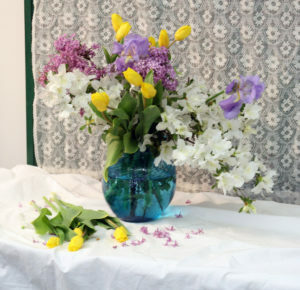 Silk Flower arrangement presented to 102 and 103 year old nursing home residents celebrating their birthdays. 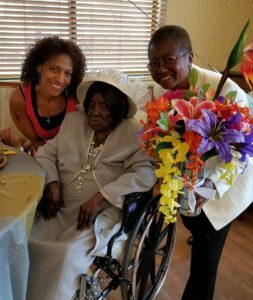 On September 8, 2017 Adopt A Nursing Home Patient Organization was honored to participate in a celebration for Marjorie Carter, 102 and Bertha Muldrow, 103 years old. 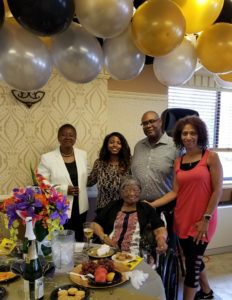 This festive event included other residents, Mayor Tony Vauss, West Ward Councilman Vern Cox, Chaplain James E. Berry and Adopt A Nursing Home Patient Board member Kim Todd and Executive Director, Rosemary Horner. 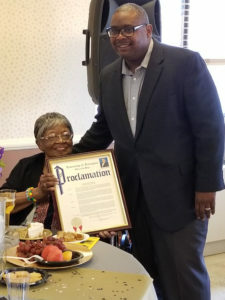 Mayor Tony Vauss Presents Proclamation to 102 year old Irvington Resident at nursing home. 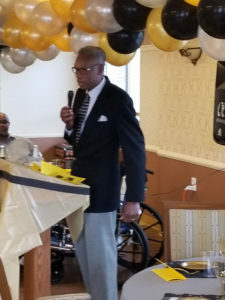 West Ward Councilman Vern Cox helps celebrate life of 102 and 103 year old Irvington Residents. Irvington Mayor, Tony Vauss and West Ward Councilman Vern Cox both spoke and acknowledged the women with words of inspiration and presented mayoral proclamations from the city of Irvington that made the family, guests and all that attended proud that they were Irvington residents. Chaplain James E. Berry shared thought provoking words and blessed them with a powerful prayer of hope and protection. Adopt a Nursing Home Patient presented them with two silk floral arrangements that were done by a volunteer, Deborah Brown. 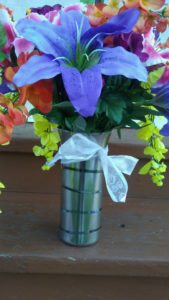 Two vases were crafted by one of the board members, Lisa Palmer. 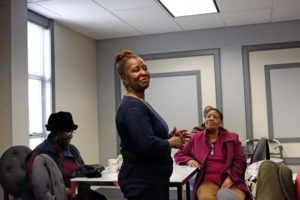 Executive Director, Rosemary Horner did an interactive presentation with the nursing home residents. Family members of 103 year old Irvington Resident BERTHA MULDROW and Rosemary Horner and Kim Todd. Marjorie Carter was born August 9 1915 in Georgia and siblings of three sisters who are deceased. At 15 years old, she married the love of her life Lee Andrew Carter who at that time was 19 years old. 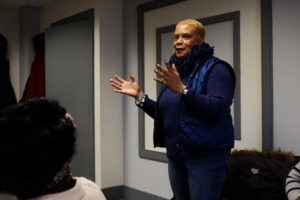 After she was married; worked as a cook/ house keeper and later in the years worked with Atlanta Life Insurance Company selling Life Insurances and was awarded `Best Seller of the Year`”. Her husband and her migrated to New Jersey and became highly involved her church and black women organization. She always dreamed of being a very important person in society. After a while, she taught her dreams were just a dream, but over the years,she had joined every club in her church and was a Sunday school, teacher and an Usher. 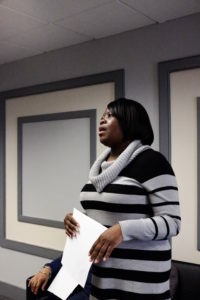 In her busy life,her husband and she became adoptive parents of three children where she then opened her heart and home to children who were in need. She became a foster mother and devoted all her life to helping children and others who needed to be cared and loved.She passed the Slavery, great World Wars and the Depression days. Ms. Carter is very pleasant where she knows everyone faces and name. She always smiles and concern of staff well-being. She continues provide her motherly love and compassion toward staff. She love music and social gatherings and has many close relationship with the other residents. Rosemary Horner , Executive Director, announced that the second meet and Greet for Adopt A Nursing Home Patient will be held on April, 29, 2017. The start time is 9:30 and should end at 10:30. It will be held at 50 Union Ave, in the the 8th floor conference room. if you have been thinking about volunteering or just want to know more about us please come. Also, we will again, assemble our care packages immediately after for our next large group event at a local nursing home. We welcome any contributions. socks, lotion, toothbrushes, toothepaste, tissues, and combs. 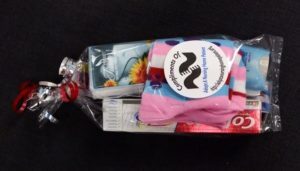 We are also desiring to add a pen , small notepad and chapsticks(or Vaseline) to the package. We are planning packages for 63 patients. Please contact Mamie, her number is below, if you can help with any of these items. If you can attend please RSVP at 973-371-9718 by April 25, 2017 Tell Mamie to have a cup of coffee or tea ready for you. PS if you cannot make it but want to donate to the cause it is welcomed. Painting Demo and Coloring Session By Raymond Horner Jr. It was sleeting and the roads were attacked with water and ice. A few of our volunteers contacted us to say they could not make it. A few were also battling with colds and flu. But a few brave souls and board members were able to provide a memorable event. Inside the dining room was transformed to a warm exciting coloring feast The elements outside could not put a damper on the excited residents who attended. 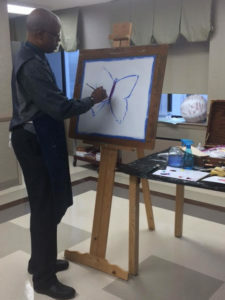 Ray Horner Jr. began to paint a beautiful butterfly. Interacting with the patients at the same time. 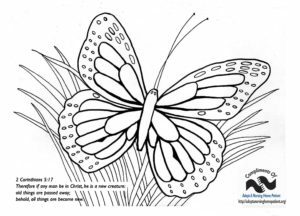 Ray also created a coloring page that each resident with the assistance of volunteers and board members choose from an assortment of coloring markers, pencils and crayons to color. The stimulation for each patient made it hard to end the session. But dinner had to replace the coloring pages on the tables. Raymond completed his picture and donated it to the facility. 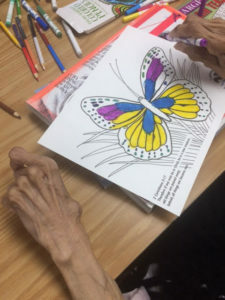 Some patients colored more than one page. The result was a matrix of pictures they will hang in their rooms. The music was good, the laughter was hearty, the songs sung gave hope on a rainy day. There were several prizes given out for the oldest, youngest veterans, etc. 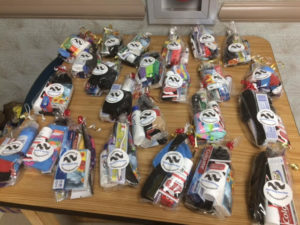 And each patient went back to their rooms with a beautiful gift bag of lotion, comb, toothbrush, tooth paste, tissues and socks. 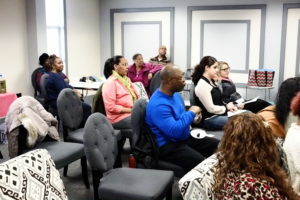 We held out very first Meet and Greet on Saturday, January 28, 2017 in Irvington. NJ courtesy of Novus Equities in their beautiful conference room. In attendance were those who wanted to volunteer, board members and those who will help us with their wisdom, expertise and prayers. Each person had an opportunity to share a passion snd expertise they had a desire to share with someone else. 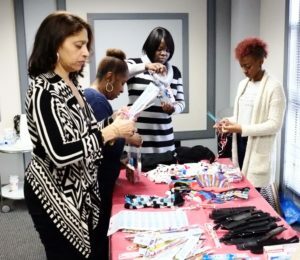 After the meeting we conducted an assembly line to create gift packages for the upcoming Art Demonstration and coloring page event at a local nursing home on February, 12, 2017. 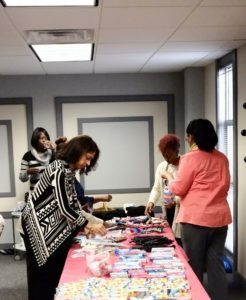 And the result was 61 gift bags with lotion, tissues, combs, toothbrushes, toothpaste and socks. Research has shown the impact of therapeutic interventions that involve art, music and crafts. 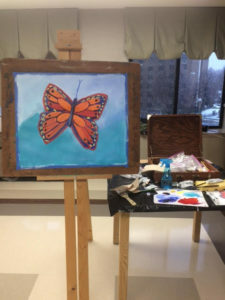 An article on Alzheimer.net discusses the impact of Art Therapy. 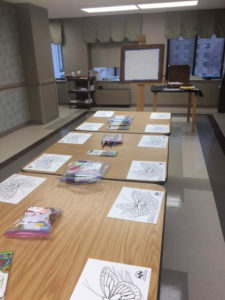 Creative activities that help to build confidence and hope in patients are a critical component to their care in nursing home settings as well as assisted living. That is why if you click on the Page on this site called Creative Tips it will take you to a blog that will share creative art, music and craft tips for care givers. There will be future posts from authors that will provide ideas that you can use in caring for a nursing home, home based or assisted living patient. If you have any ideas you would like to share please let us know. Visit a patient today and bring a flowers of hope that may help to break the bleakness of any depression that may be festering. It may not always be evident but some folks in nursing homes may be depressed. According to Centers for Disease Control the diagnosis of depression was higher in nursing homes than in Adult Day Care Centers or retirement residential centers in 2012. Because older adults may have more health issues which contributes to the likelihood that they will be depressed. If you compound that with the feelings of helplessness and loss of control and it is no wonder that many people in nursing homes get depressed. In older adults depression often occurs alongside other medical conditions. Depression can even worsen the exiting medical conditions. To add to the madness medications for these medical issues can cause side effects that may affect the persons depression. Most nursing home facilities recognize this and have a strong activities program. However, visitation from outside folks enhance the existing activity efforts. It is another reason to visit nursing home patients as much as possible. Have you ever visited someone in a nursing home? Did you ever recall how expansive their interests and involvement was before their illness restricted their activities? Did you mourn with them in the loss of that freedom and wish you could help them feel connected to some of the things that used put a sparkle in their eyes? 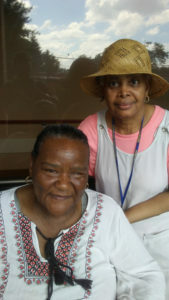 It is our desire to help nursing home patients get that sparkle back in their eyes despite their current limitations. Our volunteers want to help the nursing home activities staff provide activities targeted to individual hobbies and interests. For example, if a group of residents have been identified that used to play the guitar than volunteers who play the guitar will visit them on a consistent basis-to play the guitar not just to them but with them. For many of the patients the visits they receive from our volunteers may be one of the few they get if family and friends are not able to encourage them. We also hope to provide encouragement support sessions to staff providing direct care to the residents. Don’t they deserve a sparkle in their eyes too?